The Trailer Tow Wire Harness makes it easy to add towing capability to your Grand Cherokee without having to splice a lot of wires. 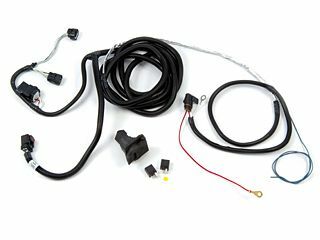 This kit from Mopar includes a wiring harness that's covered with a protective wrapping and has either a seven-way round plug or a four-way flat plug. It attaches directly to your vehicle's wiring. A dealer scan tool is required to activate the wiring. The trailer tow wire harness is not compatible with the SRT8 model. Count on JustforJeeps.com for the parts and accessories you need to outfit your Jeep for work or play. Will not work with SRT8 Models.